OK 66 was once signed along today's OK 66B in Wellston. When U.S. 66 was decommissioned in 1985, OK 66 replaced U.S. 66, and the former OK 66 was renumbered as OK 66B. OK 66 runs along parts of what was once U.S. 66 through central and northeast Oklahoma. U.S. 66 spanned from Santa Monica, California to Chicago, Illinois before it was decommissioned in 1985. Parts of the old roadways in Oklahoma, Missouri, and Kansas that were U.S. 66 are now their state highway 66. U.S. 66's routing was taken over by Interstates 15 and 40 in California, Interstate 40 in Arizona, New Mexico, Texas, and western Oklahoma, Interstate 44 in northeastern Oklahoma and Missouri, and Interstate 55 in Illinois. OK 66 begins its journey at U.S. 81/Business Loop I-40 in El Reno. Ten miles later it enters Yukon and intersects OK 92 and shares a short duplex with OK 4. OK 66 joins Interstate 44 for 12.5 miles in northern Oklahoma City before heading east in Edmond. It shares time with Interstate 35 as well. At I-35's Exit 141, OK 66 heads toward the east. It follows Interstate 44 throughout the rest of its routing, rarely straying more than 10 miles from one of the interstates that caused OK 66 to be in the first place! It meets Interstate 44 three times between Oklahoma City and Tulsa-at Exit 158 in Wellston, at Exit 196 in Bristow, and at Exit 221 in Tulsa. OK 66 isn't too far away from the other Turner Turnpike interchanges. 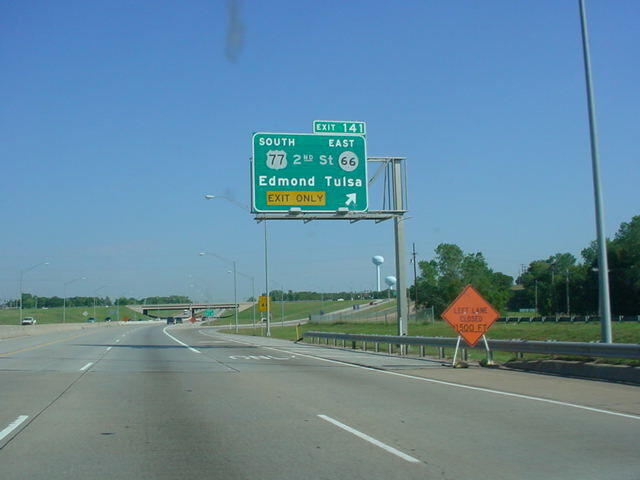 In Tulsa, OK 66 is signed with Interstate 44 all 20 miles between the Turner Turnpike's eastern terminus and the Will Rogers Turnpike's western terminus. The highway then heads off on its own at Exit 241, which was the Will Rogers Turnpike's western terminus until 2002, when the interstate was rerouted a mile to the east. OK 66 then meets OK 266 at an interchange, also built in 2002, seven miles north of Interstate 44. OK 66 shares a short multiplex with OK 20 and OK 88 in Claremore. The highway then meets OK 28A in Foyil, shares a short wrong-way duplex with OK 28 in Chelsea, and then finds its eastern terminus at U.S. 60 near White Oak, west of Vinita. "END OK 66" signage at U.S. 81/Bus. Loop I-40 in El Reno. begins straight ahead while U.S. 81 takes a turn to the south. Interstate 40 is 1/2 mile to the south of this intersection. Boulevard. The famous country singer is a Yukon native. by the modern bridge I'm driving on as I took this picture. 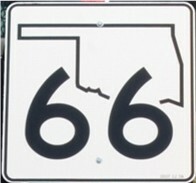 along this stretch of OK 66 still carry the U.S. 66 insignia. OK 66 East at Interstate 44 West/OK 3 East in Oklahoma City. From OK 66B East, OK 66 East at OK 66B east of Wellston.